In 1992, Nintendo released Mario Paint, an art studio for the Super Nintendo. With a click of the game’s included mouse, players could draw intricate images, create custom stamps, and even animate their own cartoons. The title even included a music generator, which is used to compose tunes to this day. 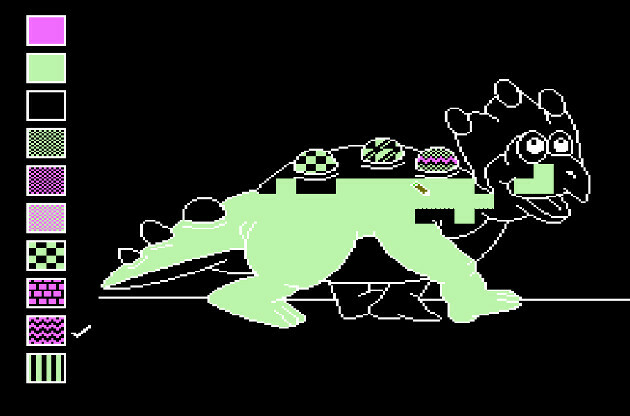 One year later, Virgin Games published a NES game called “Color a Dinosaur”. 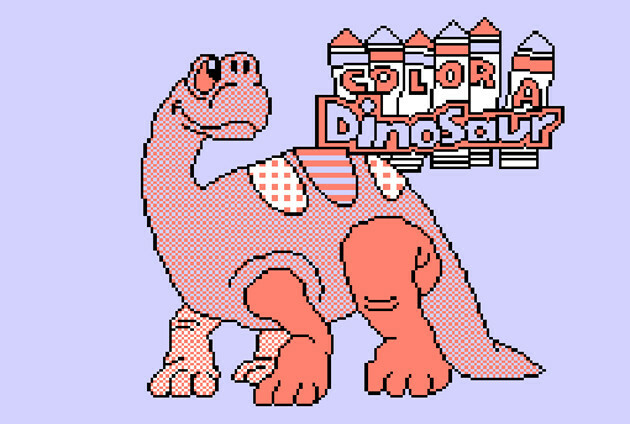 While Color a Dinosaur didn’t boast an elaborate tool set, it did allow users to color pictures of dinosaurs. The game was aimed at children between the ages of three and six — kids too young for the kind of sophisticated features other art programs offered. Unfortunately, those easily-confused children would’ve been better off with a coloring book. 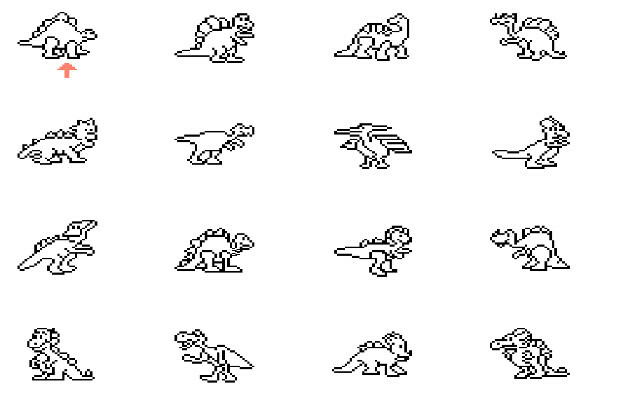 After starting up Color a Dinosaur, users are permitted to choose from one of sixteen pictures. The selection may not seem particularly impressive, but it’s probably more options than anyone needed. Most of the time, dinosaurs are awesome by default, but the images Color a Dinosaur offers are decidedly uncool. There are no spectacular poses, no thrilling action shots, no detailed backgrounds. Many of the pictures only look vaguely dinosaur-esque. Stan Gorman, the former Creative Director for Virgin Games, described them as “fantasy dinosaurs,” which seems reasonably accurate. Because the NES had a 64-color palette, the colors you could choose from were fairly limited. The game mostly offered variations on red and blue, with a few patterns to mix things up. New colors would appear if you hit the select button, but the colors of everything else would change as well. If you hit select enough times, the colors started to flash, rendering a weird, rave-like effect. But Color a Dinosaur‘s biggest problem was neither its pictures nor its palette — it was how long dinosaur-coloring took. 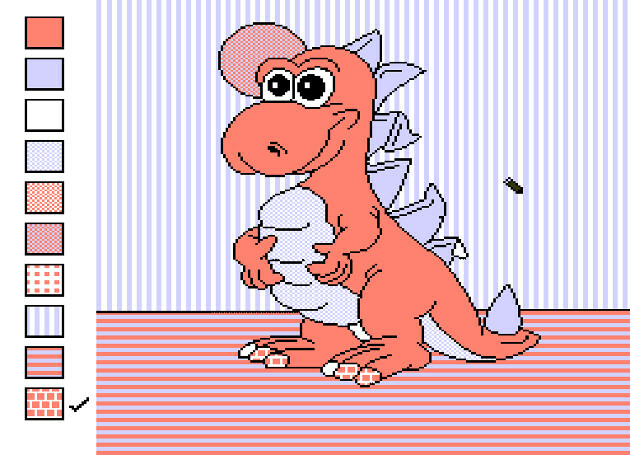 Unless you opted to color freehand — a near-impossible task with the NES controller — filling in your dinosaur was a lengthy, excruciating process. Each dinosaur needed to be colored piece by piece, and the sections only filled in a few blocks at a time. If you happened to use a pattern, the section filled in with a solid color first, then layered your chosen design over it. Impatient kids who mashed on their controllers would promptly be taken back to the select screen. If the whole thing looks like it was thrown together by some guy in his garage, it’s because it was actually thrown together by some guy in his garage. 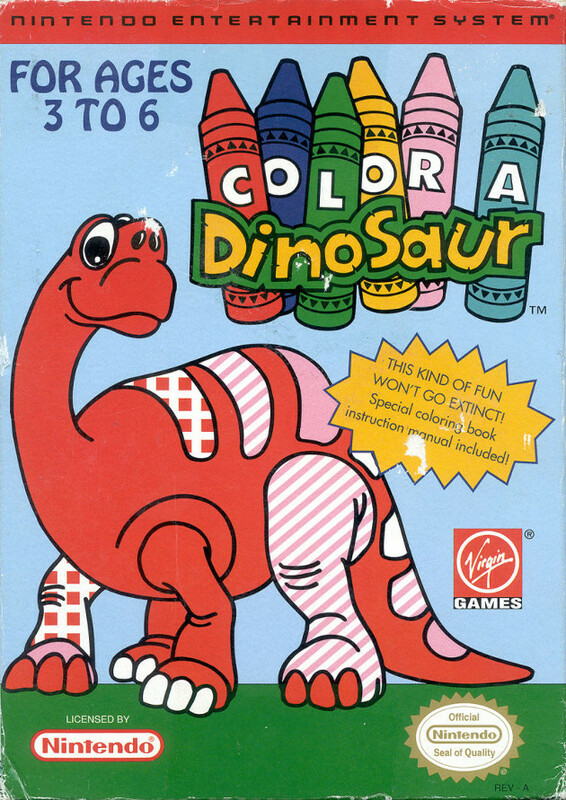 Color a Dinosaur was developed by Jay Obernolte, the founder of early indie studio Farsight Technologies. At one point, the studio employed 25 people, but most of Color a Dinosaur was the work of Obernolte alone. Of course, he did have a little bit of help. When Obernolte submitted his game to Virgin, it was missing a crucial component — audio. Those duties fell to Tommy Tallarico, a talented composer who had been working in the game industry since 1991. As Tallarico describes it, Color a Dinosaur was listed as being in development from the moment he started at Virgin. When he asked the company’s vice-president, Stephen Clarke-Wilson, about it, he was told that it was a game that one guy was working on from his home, and that no one had really seen it. A few months later, Clarke-Wilson stopped by Tallarico’s office with a new job — the music and sound for Color a Dinosaur. He also gave Tallarico a deadline. The game was being submitted to Nintendo the following morning, which meant the project needed to be completed in less than a day. Although Color a Dinosaur didn’t require a particularly complicated soundtrack, creating its sound was a tricky task. Because the NES sound driver was so complex, it wasn’t as simple as cranking out a few tunes. The audio essentially had to be programmed. Tallarico was a musician, not a programmer, and had never worked on an NES game in his life. With no time to learn the minutia of NES sound creation, Tallarico had to take a few shortcuts. He created the game’s audio with a makeshift sound conversion program (created by Stephen Clarke-Wilson) that could convert midi files to ascii files, which could then be used on the NES. The sound range was limited, but it was enough to get the job done. Thankfully, everyone involved with Color a Dinosaur went onto bigger and better things. Tallarico created the music for classic titles like Earthworm Jim and Cool Spot, won numerous industry awards, and has co-hosted programs like The Electric Playground and Reviews on the Run. As for Jay Obernolte? In 2010, he left video games behind and went into politics. He’s currently serving in the California State Assembly. No, really. Even though Color a Dinosaur was a complete disaster, it wasn’t the career-ruining kind. As far as political scandals go, “I worked on a crappy coloring game” really isn’t that bad. Tallarico’s soundtrack certainly isn’t his best work, but considering the circumstances, it’s actually pretty okay. And while the kids who got Color a Dinosaur may have been disappointed, it at least came with a coloring book. When I was 6 I played Mario not dinosaur coloring. Did you get Mario Paint? 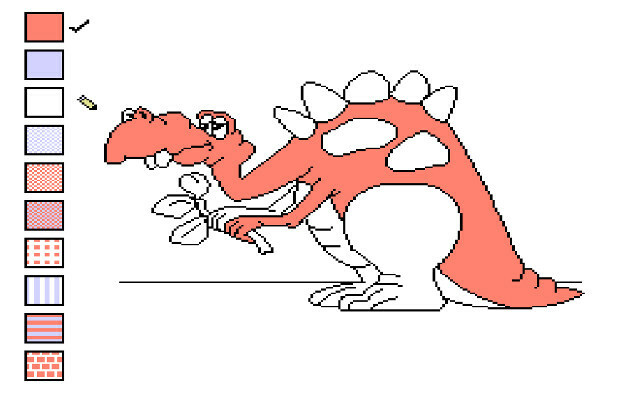 That game had a couple coloring pages, one of which had the same big dinosaur as the front cover of Super Mario World. But then the mouse made it practical.